A young fish, according to relatively small size of food and its quick metabolism, connected with growing and being in a continual move, requires often feeding. It's not an exaggeration to feed just at request, when fish with its behaviour demands another portion of food, even 6-8 times a day, to the full. As the fish grow, the feeding frequency may be reduced to 2-3 times a day in case of adolescent, approximately eight-month old fish. 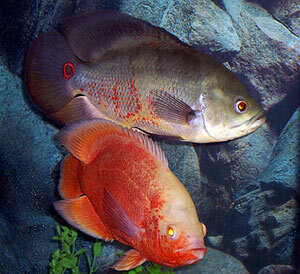 Full-grown fish, especially kept in lower temperatures might be fed once a day, unharmed its health. Older and older fish tolerate better a longer intervals between feedings, however increase of aggressiveness can be observed especially against small fish, crustaceans and snails when we place them into the same tank. That mentioned interests in small - comparing to fish size - organisms is not accidental. Oscarfish is carnivorous. The aquatic and land insects (dropping on the surface of water) are basic in their diet in the wild. That fact finds confirmation in their physique - slightly protruding lower jaw and bulging eyes enable to notice and catch the victim from the water surface. The diet is completed with larvae of mentioned insects, crustaceans (even crawfish in case of full-grown fish), snails, molluscs, amphibians, fish by chance. If we are able to copy that natural diet we should use that, keeping in mind that there are some threats connected with possibilities of carrying diseases or parasites into aquarium. Even not entering feeding intricacies, exactly calculating proper amounts of proteins, lipids, carbohydrates, minerals, vitamins etc., served food should always be diversified. Such a food variety enables delivering all necessary elements. Therefore we should feed our fish will all kind of food, that is accepted, taking care of avoiding sameness. As far as Oscarfish is concerned these possibilities are untold. In general, we can divide food for Oscars into produced especially for ornamental fish, sold as flakes or granules, home-made mixes and alive animals caught, individually bred, bought or frozen. As far as produced food is concerned - not mentioning the producers or product names - it's worth to recommend those especially purposed for chichlid fish, suited to the fish size. In theory, that food should fully cover requirements for all necessary elements, but it is better to treat them rather as a supplement, while the self-made or alive/frozen food should be basic. Produced food can be used during holidays (in an automatic feeder). Without these products it's not easy to provide fish with a proper amount of colour enhancers, which intensify fish colours (about enhancers please read in the article "Fish coloration"). Therefore that food is worth of serving. About detailed product names and opinions of them please ask using the Forum. One remark on the beginning - there are two ways of mix preparation. First one - all the mixture ingredients are minced to such a size, that can be swallowed by fish (ingredients are less crumbled). In that case, mixes are mostly weak mixtures, as the smaller parts of the mix spread in the water and cloud it. Second one - all the ingredients are minced fine, until all the elements become homogenous pulp, additionally pasted together with binding medium (gelatine, agar-agar), which will keep the ingredients together until it's swallowed by fish. Almost everything can be added to such a mix - I propose to experiment with everything that enters aquarist's head. Mixtures of first kind before serving must be rinsed on a strainer in order to remove too tiny parts. Mixtures of second kind before serving must be cut into such pieces that can be swallowed at once. When too big pieces are served, with a hope that fish crumble that by itself, it usually results with clouding the water. 1.Four parts of beef heart, one part of frozen spinach, one medium size clove of garlic per each kilogram of mixture. People suffering of spare time, may remove all strings and fat off the heart. Mince pieces of heart and spinach once in a mincing machine, with a sieve of 3- 4mm eyes. Add pulped garlic. Blend until all ingredients are exactly mixed. Put a thin (1-1.5cm) layer of the mixture on a trencher, incise with a knife into cubes of a necessary size (I cut 2x2cm cubes) and put into freezer. After freezing, break the incised block into cubes, pack tight in foil bags and place again into freezer. Use accordingly to the needs. Before serving mix must be defrosted and rinsed with water on small sized eyes strainer. 2.Three parts of beef heart, one part of any edible bird/mammal liver, one part of spinach, optionally one clove of garlic. Preparation and serving exactly as in recipe No. 1. 3.Three parts of fish (salt-water fish is safer), one part of fresh (!) mussel meat , one part of spinach, without garlic. Preparation and serving exactly as in the recipe No.1. The basic ingredients are the same as in coarse-grained recipes. Possible supplements: spiruline (instead or together with spinach), colour enhancers, vitamins (one bag of Vibovit or one tablet of vitamins for pregnant woman per each kilogram of mixture), shrimps (binding properties, additionally they include a lot of chitin and other ballast substances - after eating that, doo-doo is better), daphnia or gammarus/asellus (also dried) can be used instead of shrimps, yolk etc. We put all the ingredients into blender (meat must be minced in a mincer machine before) and mix until we get a smooth, homogeneous pulp. We should not add too much water (together with frozen spinach), if there are problems to obtain a dense consistency (as dense as rich cream) we can add gelatine (dissolve two spoonful of gelatine per each one kilogram of mix into two tablespoons of hot water, add to prepared mixture and mix exactly together). Spread the pulp in the same way as coarse-grained mix, freeze and break into cubes. Defrost before serving - and if mix does not fall into pieces in the water, serve directly in such portions that will be swallowed by fish at once. If food falls into pieces, dissolve a half teaspoon of gelatine in a tablespoon of hot water, mix with one defrosted mix cube (dimensions of mine: 2x2x1cm), put on a dessert plate. After coagulating, cut into pieces of a necessary size and feed the fish. Please note: in case that our fish got grown quicker than we managed to use the coarse-grained mix, we can use the gelatine trick and serve the mix in bigger pieces they were originally prepared.